This Heart diamond is 0.91 carat in weight, and comes with Very Good polish and Very Good symmetry, as verified from an independent gemological laboratory. The diamond is graded I in colour, and has a clarity grade of SI2. The diamond's GIA grading report number is 7153934275, which will detail further its specifications and measurements, and will also come with the purchase of the stone. This Heart diamond is 0.72 carat in weight, and comes with Very Good polish and Fair symmetry, as verified from an independent gemological laboratory. The diamond is graded D in colour, and has a clarity grade of VS2. The diamond's GIA grading report number is 1158487218, which will detail further its specifications and measurements, and will also come with the purchase of the stone. AUD 1,925 Excl. Duties / Taxes. 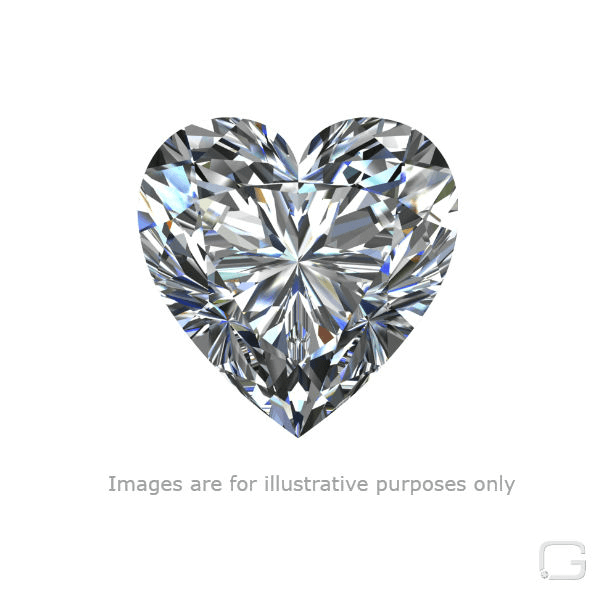 This Heart diamond is 0.84 carat in weight, and comes with Good polish and Fair symmetry, as verified from an independent gemological laboratory. The diamond is graded L in colour, and has a clarity grade of SI1. The diamond's GIA grading report number is 2195196384, which will detail further its specifications and measurements, and will also come with the purchase of the stone. This Heart diamond is 1.51 carat in weight, and comes with Very Good polish and Good symmetry, as verified from an independent gemological laboratory. The diamond is graded F in colour, and has a clarity grade of SI1. The diamond's GIA grading report number is 1152634011, which will detail further its specifications and measurements, and will also come with the purchase of the stone. AUD 19,791 Excl. Duties / Taxes. This Heart diamond is 1.51 carat in weight, and comes with Very Good polish and Very Good symmetry, as verified from an independent gemological laboratory. The diamond is graded E in colour, and has a clarity grade of VS2. The diamond's GIA grading report number is 5293979366, which will detail further its specifications and measurements, and will also come with the purchase of the stone. AUD 6,208 Excl. Duties / Taxes. This Heart diamond is 1.34 carat in weight, and comes with Very Good polish and Very Good symmetry, as verified from an independent gemological laboratory. The diamond is graded I in colour, and has a clarity grade of SI1. The diamond's GIA grading report number is 1259093047, which will detail further its specifications and measurements, and will also come with the purchase of the stone. AUD 8,598 Excl. Duties / Taxes. This Heart diamond is 1.18 carat in weight, and comes with Good polish and Good symmetry, as verified from an independent gemological laboratory. The diamond is graded F in colour, and has a clarity grade of VS2. The diamond's GIA grading report number is 2151525133, which will detail further its specifications and measurements, and will also come with the purchase of the stone. AUD 6,506 Excl. Duties / Taxes. This Heart diamond is 1.1 carat in weight, and comes with Very Good polish and Good symmetry, as verified from an independent gemological laboratory. The diamond is graded G in colour, and has a clarity grade of SI2. The diamond's GIA grading report number is 5151454101, which will detail further its specifications and measurements, and will also come with the purchase of the stone. AUD 13,260 Excl. Duties / Taxes. This Heart diamond is 1.6 carat in weight, and comes with Good polish and Good symmetry, as verified from an independent gemological laboratory. The diamond is graded F in colour, and has a clarity grade of SI2. The diamond's GIA grading report number is 16172903, which will detail further its specifications and measurements, and will also come with the purchase of the stone. This Heart diamond is 1.35 carat in weight, and comes with Good polish and Very Good symmetry, as verified from an independent gemological laboratory. The diamond is graded K in colour, and has a clarity grade of SI2. The diamond's GIA grading report number is 6147492760, which will detail further its specifications and measurements, and will also come with the purchase of the stone. AUD 10,832 Excl. Duties / Taxes. This Heart diamond is 1.64 carat in weight, and comes with Very Good polish and Fair symmetry, as verified from an independent gemological laboratory. The diamond is graded H in colour, and has a clarity grade of SI1. The diamond's GIA grading report number is 2171188546, which will detail further its specifications and measurements, and will also come with the purchase of the stone. AUD 23,721 Excl. Duties / Taxes. This Heart diamond is 1.94 carat in weight, and comes with Very Good polish and Fair symmetry, as verified from an independent gemological laboratory. The diamond is graded F in colour, and has a clarity grade of VS1. The diamond's GIA grading report number is 2191902825, which will detail further its specifications and measurements, and will also come with the purchase of the stone. This Heart diamond is 0.94 carat in weight, and comes with Good polish and Good symmetry, as verified from an independent gemological laboratory. The diamond is graded E in colour, and has a clarity grade of SI1. The diamond's GIA grading report number is 1152464197, which will detail further its specifications and measurements, and will also come with the purchase of the stone. AUD 5,911 Excl. Duties / Taxes. This Heart diamond is 0.88 carat in weight, and comes with Good polish and Good symmetry, as verified from an independent gemological laboratory. The diamond is graded D in colour, and has a clarity grade of VS2. The diamond's GIA grading report number is 11042210, which will detail further its specifications and measurements, and will also come with the purchase of the stone. AUD 7,927 Excl. Duties / Taxes. This Heart diamond is 1.09 carat in weight, and comes with Very Good polish and Good symmetry, as verified from an independent gemological laboratory. The diamond is graded G in colour, and has a clarity grade of VS2. The diamond's GIA grading report number is 2296762356, which will detail further its specifications and measurements, and will also come with the purchase of the stone. AUD 7,507 Excl. Duties / Taxes. This Heart diamond is 1.23 carat in weight, and comes with Good polish and Good symmetry, as verified from an independent gemological laboratory. The diamond is graded H in colour, and has a clarity grade of SI1. The diamond's GIA grading report number is 2227446758, which will detail further its specifications and measurements, and will also come with the purchase of the stone. This Heart diamond is 0.83 carat in weight, and comes with Very Good polish and Good symmetry, as verified from an independent gemological laboratory. The diamond is graded E in colour, and has a clarity grade of SI2. The diamond's GIA grading report number is 1279666850, which will detail further its specifications and measurements, and will also come with the purchase of the stone. AUD 23,266 Excl. Duties / Taxes. This Heart diamond is 2.5 carat in weight, and comes with Very Good polish and Very Good symmetry, as verified from an independent gemological laboratory. The diamond is graded G in colour, and has a clarity grade of SI2. The diamond's GIA grading report number is 6322286103, which will detail further its specifications and measurements, and will also come with the purchase of the stone. AUD 19,193 Excl. Duties / Taxes. This Heart diamond is 2.2 carat in weight, and comes with Good polish and Fair symmetry, as verified from an independent gemological laboratory. The diamond is graded J in colour, and has a clarity grade of VS2. The diamond's GIA grading report number is 11931096, which will detail further its specifications and measurements, and will also come with the purchase of the stone. AUD 11,674 Excl. Duties / Taxes. This Heart diamond is 1.39 carat in weight, and comes with Very Good polish and Good symmetry, as verified from an independent gemological laboratory. The diamond is graded G in colour, and has a clarity grade of VS2. The diamond's GIA grading report number is 2205200074, which will detail further its specifications and measurements, and will also come with the purchase of the stone. This Heart diamond is 2.01 carat in weight, and comes with Very Good polish and Good symmetry, as verified from an independent gemological laboratory. The diamond is graded E in colour, and has a clarity grade of SI2. The diamond's GIA grading report number is 14339307, which will detail further its specifications and measurements, and will also come with the purchase of the stone. This Heart diamond is 0.85 carat in weight, and comes with Good polish and Good symmetry, as verified from an independent gemological laboratory. The diamond is graded H in colour, and has a clarity grade of VS2. The diamond's GIA grading report number is 6183632387, which will detail further its specifications and measurements, and will also come with the purchase of the stone. This Heart diamond is 0.92 carat in weight, and comes with Very Good polish and Good symmetry, as verified from an independent gemological laboratory. The diamond is graded I in colour, and has a clarity grade of SI1. The diamond's GIA grading report number is 2131093777, which will detail further its specifications and measurements, and will also come with the purchase of the stone.